Work began on this pier in 1852 and it was opened on the 2nd of July 1853. It was so called because of the ½d toll charged (like a platform ticket). Originally the pier was twice as long as the present one but one half burnt down in 1927. It was a popular departure point for paddle steamers until after the First World War. The Pier Ticket Office is charming, typical example of late 19th century architecture. It previously had two storeys, but was without the bell cage. 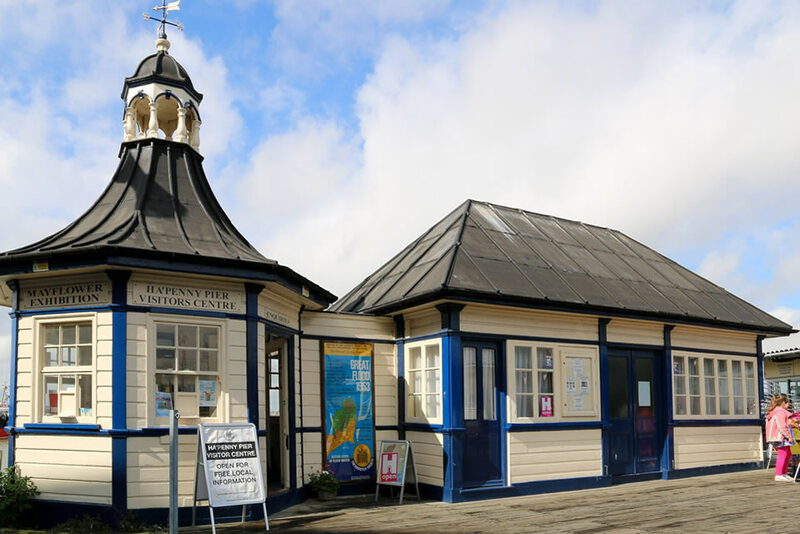 The ticket office now houses the Ha’penny Pier Visitor Centre (an information office for Old Harwich run by the Harwich Society). The Visitor Centre is open daily from May 1st until the 2nd weekend in September. It also houses the ‘Harwich and the New World’ exhibition which has free admission and gives information on links with early voyages of exploration including Jamestown and Christopher Newport and the Mayflower and Christopher Jones. Free guided tours of Old Harwich start from the Ha’penny Pier Visitor Centre during the summer season every Saturday afternoon at 1400 hours. The area of water enclosed by the arm of the pier is known as the Pound. Berthed here is the remnant of the once great 19th century fishing fleet. The pier also accommodates a café and a seafood kiosk as well as shower facilities for visiting yacht crews. Harwich Quay is a great favourite as an observation point for visitors to obtain a close-up view of the many vessels moving in and through the estuary. These vessels range in size from canoes and yachts to the vast container ships, which can be seen using the port of Felixstowe on the opposite side of the harbour and the magnificent cruise ships that use Harwich International Cruise Terminal as well as ferries which run regular services to Holland and Belgium. A foot ferry operates between Harwich, Shotley and Felixstowe during the summer months. Inside is an exhibition on Harwich and The New World, featuring Christopher Newport and Jamestown 1607 and Christopher Jones and the Mayflower 1620. Opens on 1st May 2019 until mid-October and is available for all visitors in Harwich for local information.